As the real estate boom in Dubai gathered momentum, concerns have resurfaced in the media about the reoccurrence of a price bubble. More importantly, there has been an amplified anxiety about the issue of affordable housing, and whether there is a place in Dubai for “middle-class housing” to take root. As prices move higher, with rental increases following suit, affordability will become the focal point of discussions for a large part of the expatriate population, as they look for ways to participate in the growth story of Dubai while trying to make ends meet. On a macro level, inflationary pressures will continue to vex policymakers, and this in turn brings into sharp focus the role of affordable housing in a stable and prosperous economy. It is important to note that currently Dubai is still largely a tenant-based city. According to the Dubai Statistics Centre, 13.5 per cent of the city’s population lives in freehold areas. As per the Land Department stats, one in about seven transactions are now mortgage based (a suitable proxy for home ownership). 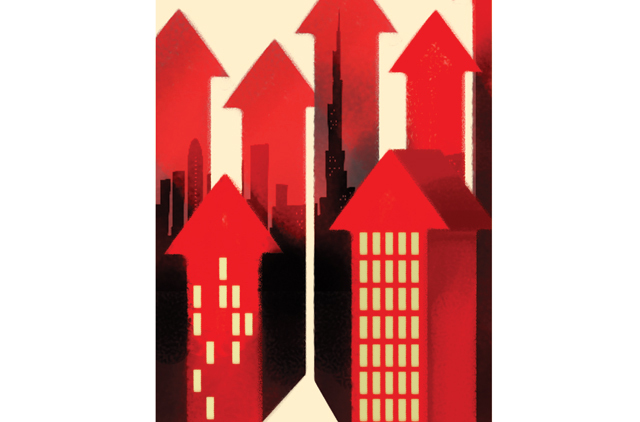 While this is a healthy trend and one which is expected to continue, two important factors to consider are that the base of house ownership (for the expatriate population) with which Dubai is starting is small, and that the incidence of mortgages that are occurring are at the higher end of the price spectrum. The second implies that for the most part, the middle-class is still not participating in the “wealth effect” of rising prices. On the contrary, with rising rents taking a larger percentage of their monthly budgets, many are being forced into Sharjah and Ajman. This too is phenomena experienced in developed countries, where satellite cities emerge to cater to the middle-class as prices move higher in the city centre (New York has New Jersey, Mumbai’s got Pune). But equally true is the fact that there are middle-class housing options available in these cities with a high percentage of home ownership. More than two-thirds of the population in Mumbai and New York are owner-occupiers. In Singapore the ownership rate is an astounding 93.2 per cent. Given that research indicates a strong correlation between home ownership and GDP (gross domestic product) growth, it is imperative for middle-class home ownership to take root for the city in the coming decade. The supply dynamics indicate that the private sector will be a part of the solution in the coming decade, especially in the Dubai World Central (DWC) area where a substantial land bank exists to cater to the burgeoning middle-income housing demand. However, incentives for private sector developers will always be skewed towards the upper income strata. It helps that it is the upper income sector that attracts higher levels of speculative capital. In light of this, if Dubai is to move towards the trajectory of higher sustainable growth, it is important to note experiences of those countries that had the challenge of a high immigrant population. Uniquely among developed nations, America’s example is the most striking in terms of housing policy, where mortgage borrowers had a multitude of benefits — tax advantages, no recourse against the borrowers’ non-residential assets If they walk away, and an implicit (in some cases explicit) guarantee by the mortgage providers Fannie Mae and Freddie Mac. While these institutions played havoc with the financial system in the 2008 meltdown, it was largely due to excessive leverage and structured instruments that added layers of leverage without any adequate explanation of risks. These institutions played a vital role in the expansion of middle-class housing ownership in the country for decades and have been responsible for a large part of sustained US economic growth. In recent years, the restructuring of these institutions have resulted in a move towards introducing more private sector capital with Fannie Mae and Freddie Mac being secondary guarantors of mortgages. Similar policies have been adopted in Singapore as well. This implies that if there is a secondary government guarantee (capped by an amount) for certain types of mortgages, it allows for two important consequences. It gives private sector developers the comfort that requisite capital is available for these projects to come to fruition. More importantly, it allows the middle-class population to buy and structure their monthly payments in a medium term product knowing that the supply is available at reasonable rates as well as knowing that there is no criminal recourse to them in the event that they face financial difficulty (eg loss of a job). From a capital markets’ perspective, it aids in the development and liquidity, as it allows the institutions to offload the mortgage risk into the markets with the latter deciding pricing points. Regardless of the castigation of housing finance institutions in the US, their importance in the development of a middle-class housing market, that of the capital markets and for economic growth was critical. Dubai has already evolved housing schemes for the national population via the Mohammad Bin Rashid Housing scheme. The goal was simple: allowing a wider base of the population to participate in the housing boom. Given its dependence on the expatriate population, a policy for the development of middle-class housing is also the need of the hour. It will allow the city to embark on accelerated economic growth and be a magnet to attract human and financial capital. Perhaps, most importantly it creates a stable middle-class. — The writer is managing director at Global Capital Partners.